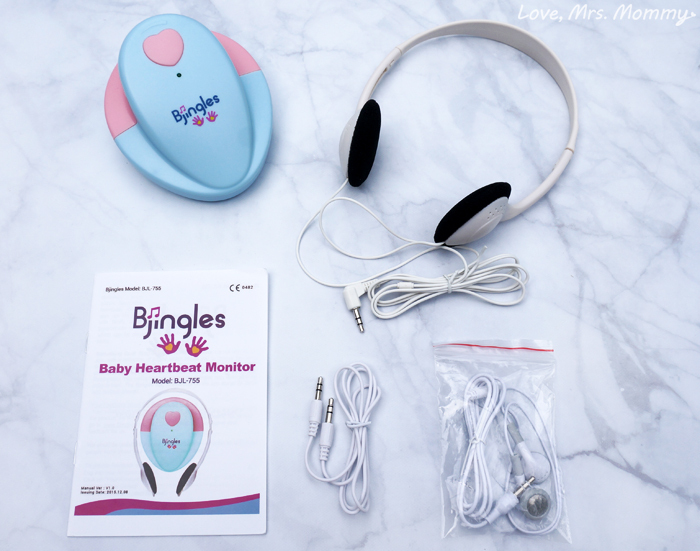 I received the Bjingles Baby Heartbeat Monitor at no cost to facilitate this review. All opinions are my own. This post contains affiliate links. You’re pregnant and you can’t wait to meet your sweet little baby. I remember all too well, waiting for those special doctor’s appointments so that I could either see or hear my little bundle of joy. Well my friends, I have a fun and exciting way to pass the time between those amazing appointments. 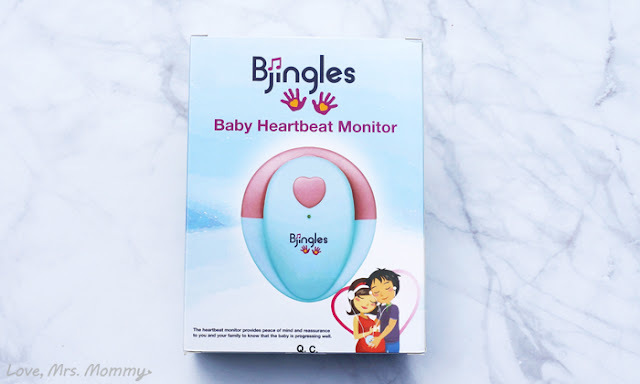 I would like to introduce you to the Bjingles Baby Heartbeat Monitor! I partnered with Bjingles to tell you all about their super simple and easy to use heartbeat monitor. No, I am not pregnant, so I can’t officially say that I found my baby’s heartbeat with this monitor. However, after reading these simple and easy to use instructions, my husband and I were able to find our daughter’s heartbeat and our own. First and foremost, please remember that the Bjingles Baby Heartbeat Monitor should NOT be used as a substitute for prenatal check-ups from your doctor. It is extremely important for your health and the health of your baby to get regular prenatal check-ups. Any questions or concerns regarding your pregnancy should be brought to your doctor’s attention. Now, for the fun part! After opening the Bjingles Baby Heartbeat Monitor, I realized just how straight forward it was going to be to use. You can actually just look at it and figure it out, no instructions are needed. But, don’t worry, they are included! Finding your baby’s heartbeat depends on a number of factors… how far along you are (you can start using this monitor at 14-16 weeks of pregnancy) and where the placenta is positioned, are just a few. There is an easy to follow gestation chart in the instruction booklet showing you where you should expect to find your baby’s heartbeat as the weeks progress. The best times to be able to hear your baby’s heartbeat are: within 30 minutes after you wake up in the morning, within 1 hour after lunch, or 30 minutes before going to bed at night. It also helps if you use the device with a full bladder, as it can help improve the heartbeat sounds. I love how the Bjingles monitor comes with two sets of headphones! They want to make sure you and your significant other can enjoy this heartwarming moment together. It’s as easy as 1-2-3 to get started! Turn on the device by using the on/off/volume control. This will light the LED and signify that you are ready! (Make sure you have unwrapped and plugged in the battery) Helpful hint: Bjingles says it is a good idea to set the volume to maximum before you touch the transducer/heartbeat receiver to the body. Pretty great, right! Not a lot of fuss or preparation, which makes it easy to get right to the fun! When you are using the heartbeat monitor it is recommended to lay in a inclined position, just as you would in a doctor’s office. Then start moving the Bjingles transducer around in slow, circular motions from side to side across your abdomen while pressing it gently until you hear a good signal. Remember, it all depends on the position of the baby, your pregnancy cycle and other factors. You might also need to angle the monitor slightly for a good signal. Remember the fetal heart is very small and the sound can be very faint (sounds like a galloping horse). Be patient and try to avoid dragging the transducer as it will create static. Here are some other really neat facts about Bjingles! Bjingles not only lets you listen to your baby’s heartbeat, kicks and other movements, but you can record them as well! How neat and what a great keepsake! You can save these precious moments forever and share them with your family and friends! Bjingles gives you step-by-step instructions on how to record and save your files. You can click here to see just how easy it is! Bjingles also comes with its own app and a collection of jingles! You can choose the music that you like, and enjoy it with your unborn baby by placing your phone close to your belly. So adorable! This app is available for Apple and Android phones. Now you can listen to your unborn baby’s heartbeat, hiccups and kicks in the comfort of your own home! Plus, you will be able to preserve these special moments forever. What an adorable idea! Please remember, this is not supposed to be used as a substitute for your regular prenatal check-ups. It is important for both you and the health of your unborn baby to be monitored by a doctor during this time. Connect: Find out more about Bjingles by visiting their website, then make sure you “like” them on Facebook and follow them on Twitter. Buy It: You can purchase the Bjingles Baby Heartbeat Monitor on their website and Amazon. Win It: *4* lucky readers are going to win a Bjingles monitor! This giveaway starts September 5th, right here at LoveMrsMommy.com! What a cool product! Thanks for sharing. This sounds so amazing! I would love to get one of these so my boys can share in the excitement of our next baby! This product sounds so amazing and one item I so want to get for a friend who is expecting. Love this!! Such a magical sound to hear!! Absolutely reassuring too!! Hubby missed a ton of my appointments and would've love to be able to hear the heartbeat whenever he wanted!! I'm pregnant right now with baby #2, just over the halfway mark. Perfect timing! I love that this can record. I love that you can listen to the babies heartbeat. So cool. That is so awesome. I would have loved to have one when I was pregnant. I have two daughters though, would like it for when they have kids. The Bjingles baby heartbeat moniter sounds awesome. And I know it will bring so much comfort to Mom's... A great way to keep an eye on your baby in the womb. You should check out xnspy application to keep track of your kid whereabouts. Now parents can choose between audio-only monitors and video or movement Portable Monitors For Travelling.. Pretty cool, i think this is the perfect moment and no words to describe the feelings when i was listen the heartbeat of my baby. :) Now she is 1 year old.